Do you own a business? Work for a community-minded employer? 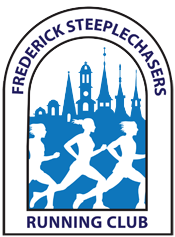 The Frederick Steeplechasers are offering sponsorship opportunities for the Frederick Women’s Distance Festival. A sponsorship provides great marketing exposure and benefits the Frederick community through our contribution of net proceeds to the The Women’s Giving Circle of Frederick County, Maryland. The RRCA Club Challenge will not be rescheduled. For those of you interested in the MD Grand Prix series, the race will be replaced by the HCS Metric Marathon, on Sep 20. Note this is on the same date as Rick’s Trail Run, which is an FSRC Grand Prix event.